Ms. Celia Lao, CEO of AirAisa Hong Kong and Macao (2nd from the right); and Ms. Sarima Chindamat, Director of Tourism Authority of Thailand Hong Kong Office (2nd from the left), joined the celebratory event to launch the Krabi-Hong Kong and Krabi-Macau routes in Hong Kong. Hong Kong, 9 October 2018 – AirAsia celebrates 10 glorious years of flying to Hong Kong by adding new routes Krabi-Hong Kong and Krabi-Macau, available for booking today at promotional fares. AirAsia Group began flying to Hong Kong in May of 2008 with its first route Kuala Lumpur-Hong Kong operating 7 times a week. Today, AirAsia flies up to 84 flights to Hong Kong each day with direct routes from Kuala Lumpur and Kota Kinabalu of Malaysia, Bangkok’s Don Mueang, Phuket and Chiang Mai of Thailand and Manila of the Philippines, which together transported over 9 million people. 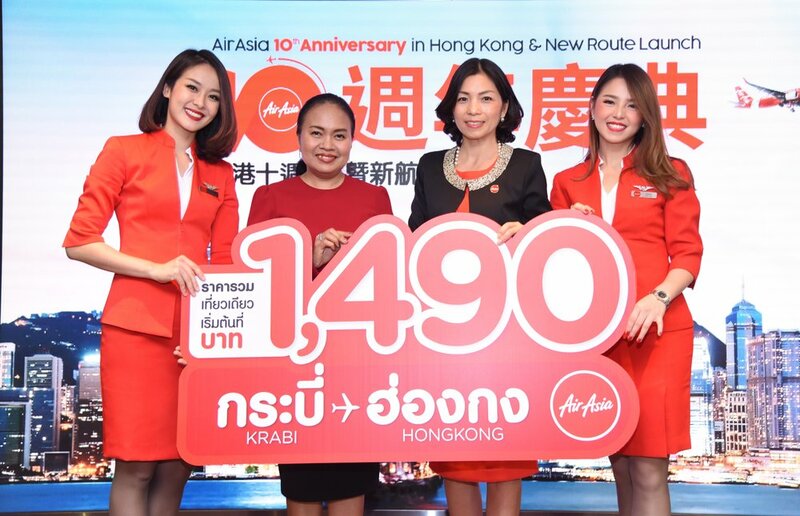 Ms. Celia Lao, Chief Executive Officer of AirAsia Hong Kong and Macau, said that 10 years ago AirAsia pioneered low cost flights to Hong Kong and has grown steadily ever since to now operate flights to 7 destinations in ASEAN with more to be added. “Apart from celebrating our 10th anniversary in Hong Kong this year, we also received the World’s Best Low Cost Airline Award for a 10th year in a row. We could not have achieved any of this without the support of our passengers, state agencies and the private partners who have worked with us for the past decade. This 10 year anniversary truly is a crowning achievement for AirAsia,” she added. To mark its success, AirAsia is introducing direct flights from Krabi to Hong Kong and Macau at special promotional fares. Fly Krabi-Hong Kong from only 1,490 THB one way starting 2 December 2018. Book today to 21 October 2018 for travel from 2 December 2018 to 29 March 2019. Krabi-Macau starts at only 1,290 THB one way with flights beginning 1 December 2018. Book today to 21 October 2018 for travel from 1 December 2018 to 30 March 2019 at www.airasia.com and all other ticketing channels.